it's GUNS that are the problem. The gun that kills guns, not people. Safe and completely harmless to people when used as directed. Why have a weapon that can hurt people, when it is well known that people aren't the problem? Everyone knows it's the guns the bad people have that are the problem. Parents: Guns carried by drug dealers in your neighborhood turning up the heat on your kids? 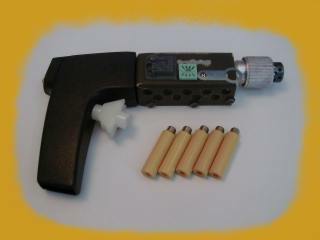 Turn up the heat on those guns and keep your kids safe from them by carrying an anti-gun gun from PieceCo. New Mark 5 features make it safe enough for kids to play with. Guns carried by school bullies bothering your kids? Insure your childrens' safety from those guns by equipping them with the new Mark 5. When the guns (or Mark 4's) those bullies have start heating up, the bullies will be sorry they were packing. Since the Mark 5 only kills guns, they are completely safe in the school environment. Many leading school districts have approved this anti-gun for possession by minors in the classroom, and encourage live target practice by shooting at and destroying real guns during recess and free play time. Send for free catalog of accessories. Not intended to be used near law enforcement officials or armed security guards. May be damaging to poor quality imitations of Leatherman Tools and Swiss army knives. If you have previously purchased a Mark 4 Agg, we have overcome the problem of the guns' ability to melt each other. Please return your Mark 4 Agg for a free Mark 5 replacement. We will pay all shipping charges.